Lipsticks and Lashes: THE SPRING BLOGGERS SNAIL MAIL - SIGN UPS NOW OPEN! THE SPRING BLOGGERS SNAIL MAIL - SIGN UPS NOW OPEN! 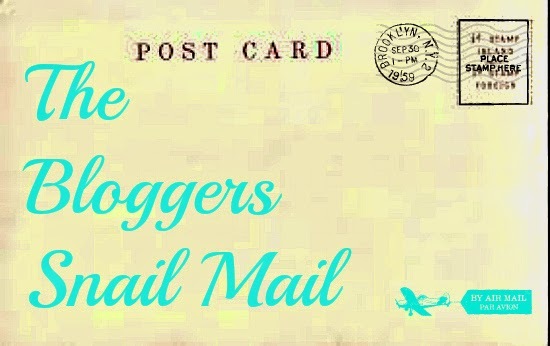 The Bloggers Snail Mail is now officially one year old!! I can’t believe I’ve been running this project for a whole year! I have had so much fun organising this project and chatting to lots of new lovely bloggers, I really hope you get as much out of it as I do. A quarterly gift exchange where you can meet other bloggers from around the world and spread a bit of positivity! People get paired up in March, June, September and December. During the sign up period, every participant will be paired with one other new participant and you’ll spend a few weeks becoming BFFs (i.e. reading each other’s blogs, sending happy e-mails, you name it!). After that, you’ll send your partner a gift from your country that you think they may like from the info you now know about them. There’s a £5 limit on the gifts to make this project as affordable as possible. Be as creative as you can and make it meaningful! Motivate them, tell them all the beautiful things you learned about them, and make them feel special! We could all use a little encouragement, especially from our new friends. Also, each package should include a postcard (or a letter if you can’t find one!) with some motivating love or positive words of wisdom written all over it. So to sign up for the ‘The Bloggers Snail Mail’ you just need to send an email to whatsinyourmakeupbag@gmail.com, title it ‘The Bloggers Snail Mail’ and include in it your name, where you are from, and you blog! Sign ups will be open until the Friday 27th February. I will then randomly match you all up aiming to make sure you are with someone from another country or at least in another area from you! I will then let you know by Monday 2nd March who your partner is and you then have 4 weeks to get to know them! So the week of the 30th March, you can then send your new buddy their Snail Mail! Once you receive your gifts, write a blog post about your experience, sharing what you gave, received, and learnt through this being part of this and meeting your new pal. If you want to tweet about this project, use the hashtag #TheBloggersSnailMail, You can also tag me @GemmaMarieJames and ill retweet your post, so everyone can share your experience! Please only sign up if you definitely are willing to take part and if you want to be matched with someone from the same country as you to save on postage then please let me know!! Valentines Cards for the Non Soppy!